I am not really a fan of motorcycles nor do i really know how to ride a motorcycle. I vaguely know how to ride a scooter, and i can ride a bicycle…..but bicycles are boring, and scooters have no balls. Although there have been may instances where I have wanted to just buy a cheap scooter and explore the city. A few days ago I spotted a motorcycle which really got my blood running. It was a black Moto Guzzi 850 with green and white stripes on the side of the bike. I rarely look at the motorcycle and think “WOW!” but when i saw this one, I definitely felt like that. It made me wanna learn how to ride a motorbike, and it made me wanna have one. 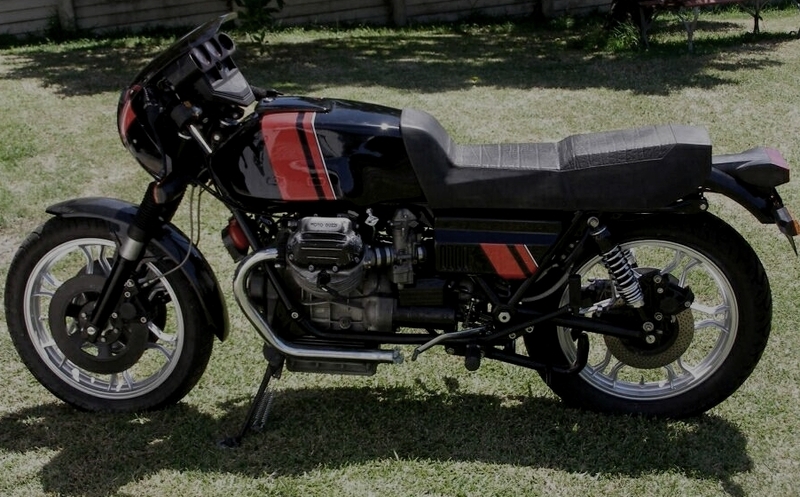 I have no knowledge of motorcycles or of Moto Guzzi motorcycles….but i’m just learning a little bit about em at the moment. This one isn’t exactly like the one i saw, because the one i saw had green stripes, but i believe it is the same model with a different paint finish.